Apple has officially launched its next generation Apple New iMac and 13-inch MacBook Pro with Retina Display support at its special event held in California, USA on 23rd October, 2012. The all-new 13-inch MacBook Pro with Retina Display is quite thinner with redesigned slimmer shape with 20% thinner than the previous model of 15-inch MacBook Pro. The display resolution of 13-inch MacBook Pro with Retina Display is 2560x1600 with 178-degree viewing angle and approx. 75% reduction in reflection while on the other side the all new Apple iMac is also a slim model of its iMac desktop computer which is quite thinner with just 5mm thick and switches Intel's Ivy Bridge Core i5 and Core i7 processors support. 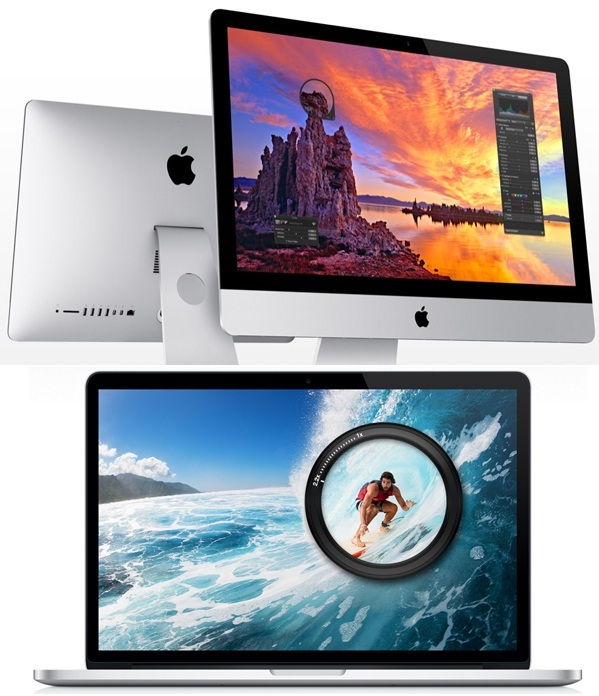 Apple iMac Screen size is same, a 21.5-inch model and a 27.-inch model and it will be available in both size for consumers. In this post we will discuss both models of Apple's New iMac (2012) and 13-inch MacBook Pro with Retina Display Features, Specs, Price, Review & Availability details. The all New iMac from Apple have got new design and shape and it’s quite slimmer, lighter and faster as compare to its previous desktop computers. 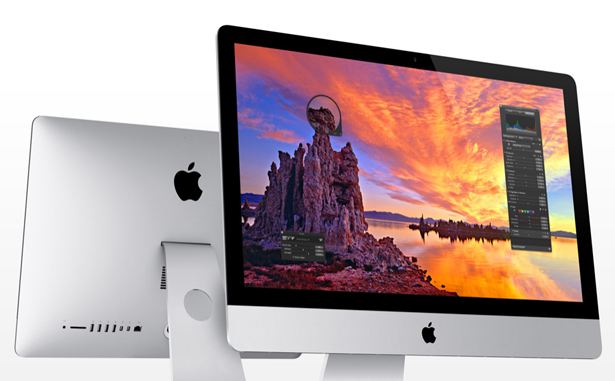 Apple New iMac will be available in both screen size of 21.5-inch iMac and 27-inch iMac with the support of Intel Core i5 processor and Intel Core i7 processor. Apple New iMac has LED-backlit display with IPS technology with the screen resolution support of 1920-by-1080 with support for millions of colors. Both of models of Apple New iMac comes with NVIDIA GeForce 600 graphics chipset with the support up to 32GB of RAM, a 720p front camera with dual mic, and with internal storage capacity of 3TB HDD, 768GB SSD or Apple's new Fusion drive that mixes 1TB or 3TB of normal storage and 128GB of flash. Apple New iMac also includes up to 4 USB 3.0 ports with Wi-Fi networking and Bluetooth 4.0 wireless technology. Apple New iMac will also have a latest OS X Mountain Lion operating system installed. 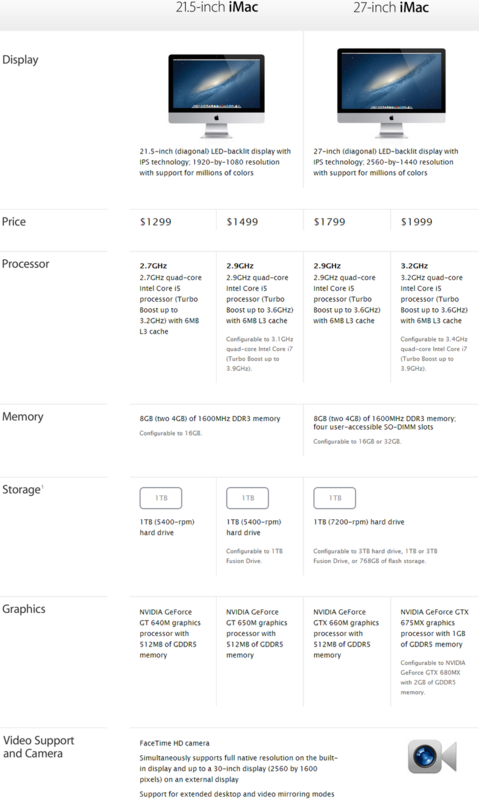 For more information and technical details of Apple New iMac you can see Apple New iMac (2012) Full Software and Hardware Technical Spec Chart below for more advanced features and details. Apple New iMac will be publicly available for consumers from November, 2012. The 21.5-inch iMac model will be shipped with the price tag of $1,299 for the 2.7GHz Core i5, 1TB hard drive and 8GB of RAM from November, 2012 and 27-inch iMac model will be shipped with the price tag of $1,799 for the 2.8GHz Core i5 and the same storage and memory from December, 2012. Consumers can place their Pre-Orders from Apple Store official website. The all new Apple 13-inch MacBook Pro with Retina Display is also a thinner and slimmer device as compare to its previous models of MacBook Pro which is 20% more thinly than the previous model. Apple 13-inch MacBook Pro with Retina Display is featuring value added Software and Hardware specs and interface which makes it better along with retina display feature. Apple 13-inch MacBook Pro has screen resolution of 2560 x 1600 which is much higher than even the most premium of notebooks from other manufacturers. Apple 13-inch MacBook Pro has native resolution at 227 pixels per inch with the support of millions of colors and has scaled resolution of 1680-by-1050, 1440-by-900 and 1024-by-640 pixels. Apple 13-inch MacBook Pro will have a support of Intel Core i5 processor and Intel Core i7 processor. Apple 13-inch MacBook Pro with Retina display uses a flash-only storage system, lacks an optical disc drive and comes with a high-end dual-core Intel chip, but, lacks a dedicated graphics card, instead opting for integrated graphics with the storage capacity starts at 128GB and goes up to 768GB. Apple 13-inch MacBook Pro have also got the FaceTime camera which can take 720p photos and videos, MagSafe is replaced with the slimmer MagSafe 2, and two Thunderbolt and USB 3.0 ports are also included. Apple 13-inch MacBook Pro will also have a latest OS X Mountain Lion operating system installed. For more information and technical details of Apple 13-inch MacBook Pro with Retina Display you can see Apple 13-inch MacBook Pro Full Software and Hardware Technical Spec Chart below for more advanced features and details. 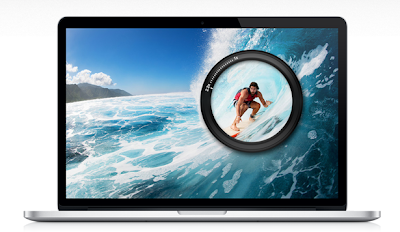 Apple 13-inch MacBook Pro with Retina Display will be publicly available for consumers from November, 2012. The cost of Apple 13-inch MacBook Pro will starts from $1699 for dual-core Core-i5, 8GB RAM, 128GB storage which is $200 jump over the high-end 13-inch MacBook Pro without Retina Display. The cost of Apple 13-inch MacBook Pro with its dual-core processor and larger storage capacity adds another $300 to the price starts at $1999. Consumers can place their Pre-Orders from Apple Store official website.